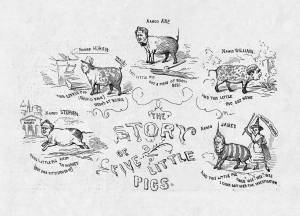 "The Story of the Five Little Pigs"
This Vanity Fair cartoon is based on the children’s nursery rhyme of the same name. The artist presents Stephen Douglas as the pig who goes to market, repeating the Charleston Market metaphor of an earlier Vanity Fair cartoon ("Dancing for Eels…," April 21, 1860). Horace Greeley’s role at the Chicago Republican convention is criticized by declaring him the pig who should have stayed home. Abraham Lincoln is the pig who gets roast beef, that is, the Republican presidential nomination, while the losing candidate William Henry Seward is the pig who gets none. New York politico Thurlow Weed is sketched as a weed. James Buchanan is the pig who cried all the way home because of the investigation by Congressman John Covode, seen as Old Mother Hubbard.